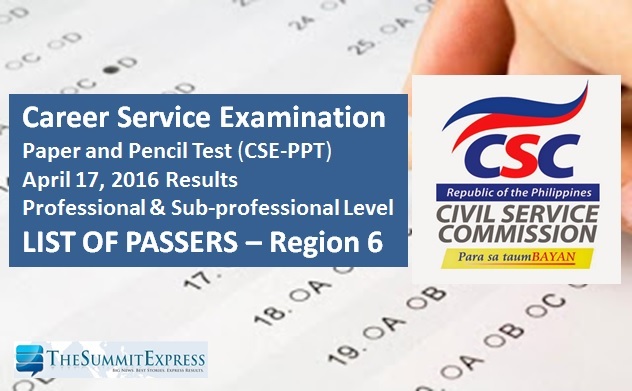 The Civil Service Commission(CSC) officially released on Thursday, May 26, the results of April 2016 Civil Service Exam - Paper and Pencil Test (CSE-PPT) known as the career service exam. A total of 1,391 examinees passed the professional level tests in Region 6 (Western Visayas). On April 17, a total of 229,463 took the examinations in at least 57 centers nationwide. Below is the full list of successful examinees for Region 6 (Aklan, Antique, Capiz, Guimaras, Iloilo including Negros Occidental of the Negros Island Region) civil service exam (CSE-PPT) professional level.